Excluding one or two books over the last three years I have been exclusively reading New-to-Me books since joining CBR. This year I wanted to reread some books I hadn’t read in a few years and while I really want to tackle some of the books from my high school English classes I started with Harry Potter. I am a huge fan of the movie series (despite owning all the dvds I will still drop everything if Freeform is running a marathon) but I have only read the first three novels. Normally I am a staunch believer in reading the book first but the film adaptations were so rich that when I fell behind in reading I bent my own made up rules. Everyone knows the story: Harry Potter’s parents died when he was an infant and he was left to grow up with his cruel aunt and uncle. Harry has always had weird things happen around him and on his 11th birthday he finds out why; he’s a wizard. His parents didn’t die in a car accident but were actually murdered by a power hungry wizard named Voldemort, also Voldemort tried to kill Harry when he was a baby but he failed. Now that Harry is eleven he is admitted to Hogwarts school of Witchcraft and Wizardry to study magic; on the train to school he befriends a boy named Ron who clues him in on wizard culture. 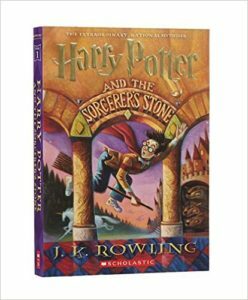 Throughout the school year Harry is both a celebrity and a fish out of water; his cluelessness about the wizarding world leads to a lot of explanation which also benefits the reader. The main plot in Sorcerer’s Stone is Headmaster Dumbledore has hidden a mysterious object in Hogwarts; Harry and his friends discover what the object is, the history behind it and that someone trying to steal it. The trio takes it upon themselves to protect the stone and hijinks ensue. Their number one suspect is Professor Snape, the Potions teacher that appears to dislike Harry upon introduction, and he continuously pops up at suspicious times. The mystery is doled out in small doses and interspersed with typical (wizard) high school antics, misdirection and misinformation. It’s the weakest of the stories but still holds your interest. The novel did a better job developing the relationship between the boys and intelligent “muggle born” witch, Hermione, as well as expanding the roles of tertiary characters like Neville and Seamus. There are also a few characters that are omitted in the film adaptations despite being fun additions to the colorful world (I’m looking at you Peeves). All in all I’m reminded just how rich Rowling was able to make this world and how it really catches you from the get-go. I’m interested to see how the later books, especially ones that introduce new characters, continue to differ from the books. Share the post "Yer a Wizard Harry!" Ooooo, I’m so excited for you to read the books you haven’t read yet. They are so much richer. There are few pleasures in the world which measure up to a new to you J K Rowling book. I’m looking forward to your Harry Potter reviews. Yes, so excited for you to continue this!